M-529 is an oil-based package of corrosion inhibitor for lubricating oils. 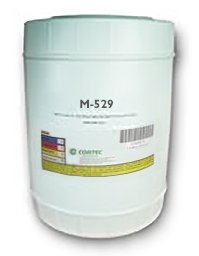 M-529 provides excellent corrosion protection during operating conditions and intermittent operation. M-529 is very effective for mineral and synthetic based oils: napthenic, iso-paraffinic, PAOs, etc. For lubricating oil systems in intermittent operations, add M-529 to oil at a concentration of 2-5% by weight. M-529 is a unique oil additive which effectively prevents corrosion of engines during storage and at the same time decreases high-temperature oxidation and wear of metal in working engines. Carbon steel was tested in extreme humidity, with M-529 as an additive according to ASTM D-1748, corrosion resistance was provided for 480 hours. Tested in Castrol Dieselall® SAE 10W30 and SAE 15W40 engine oils, M-529 dramatically improved protection of carbon steel and copper in a humid atmosphere (ASTM D 1748), and protected carbon steel according to the Ball Run Test in acidic conditions. When tested in the Cummins High Temperature Corrosion Bench Test and Multimetal Cummins Bench Corrosion Test, M-529 caused no adverse affect on chemical and physical parameters of oil. Field tests in a gasoline-powered V-8 engine confirmed that incorporating M-529 to engine oil reduces the wear of metals and preserves the oil from oxidation. Exxon Mobil 320 SHS with 4.5% M-529 L passes Load Stage 12 when tested according to ASTM D 5182, Evaluating the Scuffing Load Capacity of Oils (FZG). Available in 5 gallon plastic pails (Cortec Product # 14503096) or 55 gallon metal drums (Cortec Product # 14503097). 5 gallon drum weighs 50 pounds and ships under our standard shipping rates. The 55 gallon drum must be shipped by truck. We will provide you with a freight quote before we ship this product. M-529 should be sealed before storage. The shelf life is up to 24 months.